We spent a week in this lovely condo in a very nice complex, enjoyed the pool and everything else on offer. On the doorstep of everything on offer in Palm Springs, walking distance to the shops, restaurants etc. Gary is the perfect host, we will be back! Great condo- well equipped and very clean! Gary is very easy to deal with and responsive in his communication. We appreciated the drinks and snacks left for us upon arrival. The bed is very comfortable and we enjoyed sitting out on both decks, depending on which one had sun. We made use of the bbq on the back deck which worked well. The pool is wonderful- always chairs and some shade available, and never crowded. The walk to downtown Palm Springs was very easy and we enjoyed Ristretto Coffee on Palm Canyon and Woody’s for Motown night on Sunday! Overall wonderful stay and good value. Gated safe community. Well-groomed and beautiful. Very private. Gary was a great host who met us at the gate to the property. He showed us around and actually had to come back for us because I messed up the bedroom television. He was happy to help us out and assist us in enjoying our stay. The unit was clean and comfortable and we enjoyed the two balconies very much. 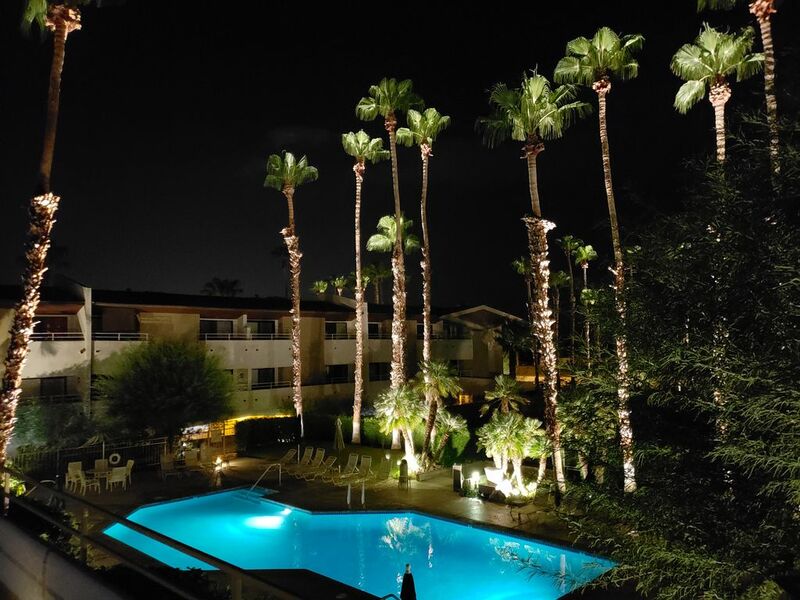 We BBQ'd one night and had a beautiful steak dinner on the balcony and enjoyed the beautiful night lights provided on the palm trees and reflecting off the pool. Comfy, cozy, and it had everything you could need when you are away from home. We will be back next time we book a Palm Springs holiday! Thanks Gary! The host was most accommodating in meeting us and providing good things to snack on when we arrived. The bed was wonderful - everything you could want to cook with was in the kitchen. Would certainly stay there again when we visit Palm Springs. Had a great time in this nice condo right in downtown Palm Springs. The owner was great. Met us at the condo when we arrived. It was stocked with some snacks and drinks which we really appreciated.